In the financial advisory world, assets under management, or AUM, is a key metric. Most advisors, both traditional and robo-advisors, earn their income as a percentage of AUM. The greater the amount of assets under management, the more income for the company. Experts estimate that robo-advisors could see their assets under management increase by over $800 billion over the next five years as they continue to plow investors’ money into electronically traded funds (ETFs) according to a recent report by PricewaterhouseCoopers. A.T. Kearney estimates that digital advice could grow to over $1 trillion by 2020, a 68% increase over current levels. As robo-advisors continue to grow in popularity, it’s interesting to track the growth of robo advisors’ AUM. Notice that the two top robo-advisor AUM leaders trend towards large investment brokerage houses with ample existing clients under roof. While the 3rd through 5th places go to the oldest stand alone robo-advisors; Betterment, Wealthfront and Personal Capital. 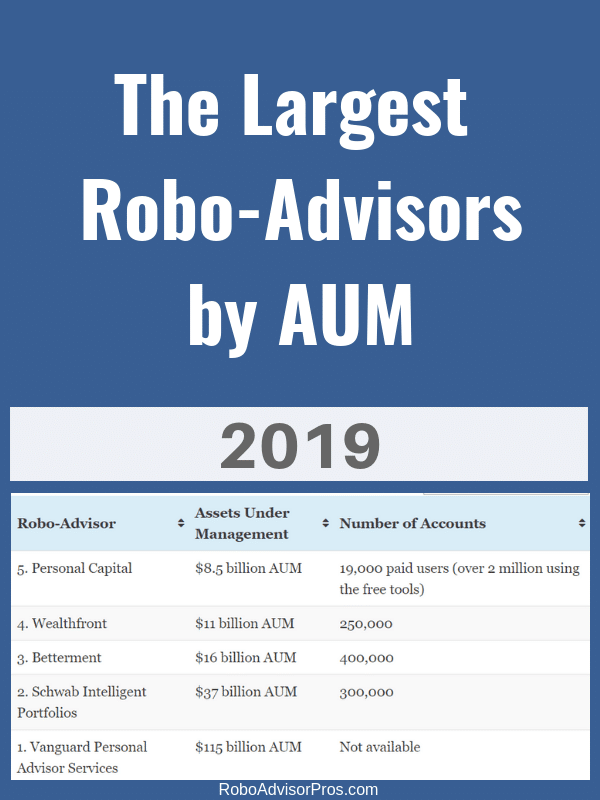 In this updated 2019, “Robo-Advisors with the Most AUM” the top 5 robo-advisors remains the same as last year, although each has grown their users and assets! For this report, we reached out to 33 robo-advisors and requested their assets under management and number of accounts. We received 14 responses. In the future, we hope to expand the list. Below is a synopsis of the top five most popular robo advisors with the most assets under management, how much money investors have entrusted them (their current AUMs) and differentiating features that set each apart from the others. In the next section, we’ll include information about the remaining nine robo-advisors that responded to our request. Personal Capital is an automated investment manager with a free investment management platform. The free money management software offers a complete view of your financial picture all in one place. The site provides a way to view bills, income, debt, investments, and more from a single location. Personal Capital allows its customers to link their existing banking accounts to the site, which gives clients the ability to track their spending, retirement savings and their portfolio’s performance. The site also offers digital advice based on your investments and financial accounts. Their free retirement planner allows users to test various scenarios to find out how their assets and income holds up. Although the basic level of the service is free, the company offers Personal Capital Advisors, a paid comprehensive automated investment advisory service with dedicated financial advisors. The paid service requires a $100,000 minimum account balance. The investment management approach is unique, with a sector-based asset allocation and access to individual stocks. Personal Capital also provides typical rebalancing and tax-loss harvesting along with dedicated Certified Financial Planners for all clients with managed accounts. Personal Capitals provides performance data, from 2012 though 2018 shows better annual returns than their target benchmarks for five of the six managed portfolios. Personal Capital’s fees start at .79% for accounts up to $3 million and decline as AUM fall. Wealthfront is a low-cost leader in the robo advisory space. They offer great research, low fees, and index matching returns based on individuals’ unique risk profiles. The site offers daily tax-harvesting, direct indexing, and automatic rebalancing. Path, is Wealthfront’s all digital financial advisor. Visit the Robo-Advisor Selection Wizard – answer 4 questions and find out the best robo-advisor for you. Wealthfront allows you to see exactly how much to save and invest for the future. It also shows you how life events and changes will impact your account. The platform provides a complete financial planning picture and answers your financial questions without having to talk to a traditional financial advisor. The service is free for accounts valued at $5,000 or less. Wealthfront charges 0.25% AUM for account values over $5,000. Like most robo advisors, Wealthfront invests clients’ funds in exchange-traded funds that track 11 major asset classes and offers multiple account types. Larger accounts qualify for direct indexing or the opportunity to invest in individual stocks. Like most of the leading robo-advisors, Betterment offers investors automated tax-loss harvesting, rebalancing, and tax-efficient techniques. A unique Betterment feature is the opportunity for all clients to text questions to and receive answers from a human financial advisor. Betterment is at the forefront of robo-investing by offering not only access to financial advisors but socially responsible, smart beta and income portfolio investment options. Not one to relax, Betterment recently launched low cost a la carte financial planning packages and a high yield savings account. There is no minimum account balance required for Betterment investors who use the company’s digital plan. Betterment charges only 0.25% AUM for accounts valued up to $2 million for its Digital Plan, with zero management fees for additional assets. Betterment also offers a Premium Plan, which requires a $100,000 minimum investment and charges a 0.40% AUM. Betterment Premium offers access to Certified Financial Planners. Schwab was the best performing robo-advisor for 2017. The second largest robo-advisor from powerhouse Charles Schwab is the only one of the top five robo-advisors with zero management fees, for their basic Schwab Intelligent Portfolios offering. The minimum balance to open an account with Schwab Intelligent Portfolios is $5,000. Like other robo advisors, Schwab Intelligent Portfolios offers tax-loss harvesting, rebalancing, and other features. The service earns management fees from its own ETFs and other third-party funds that it recommends to its customers. The site offers clients investments in individual retirement accounts (IRA), 401k retirement plans, 401k rollovers, taxable accounts, and trusts. For investors seeking more personalized services, newly rebranded Schwab Intelligent Portfolios Premium also provides unlimited human financial advisor consultations like Personal Capital or Betterment Premium. Other add ons include a comprehensive financial plan and interactive online planning tools. This service requires $25,000 AUM and charges a one-time $300 planning fee and a $30 per month, subscription model. The largest robo-advisor, this year and last, is Vanguard Personal Advisor Services. Vanguard is a product of legendary John Bogles’, index fund house. As of September 30, 2018, the entire Vanguard Company managed $5.3 trillion in global assets for more than 20 million investors across the globe. Unlike other robo advisors, humans lead Vanguard Personal Advisor Services. Financial professionals and their clients create, manage, and rebalance their investment portfolios based on the customer’s needs and financial situation. Vanguard Personal Advisor Services requires a $50,000 minimum account balance, which accounts for the hands-on approach not typically seen in the robo advisory community. Vanguard charges a 0.30% AUM fee, and there may be additional commissions or other fees depending on the investments you and the advisor choose. For accounts that have less than $500,000 invested, clients have access to a team of advisors instead of a dedicated financial planner to work with you. In addition to the largest robo-advisors, following are nine other robo-advisors that responded to our request for assets under management information. Just because a digital investment manager oversees a large amount of investment dollars, doesn’t make that company the best robo-advisor for you. I have accounts with several robo-advisors, not all on the top 5 list. 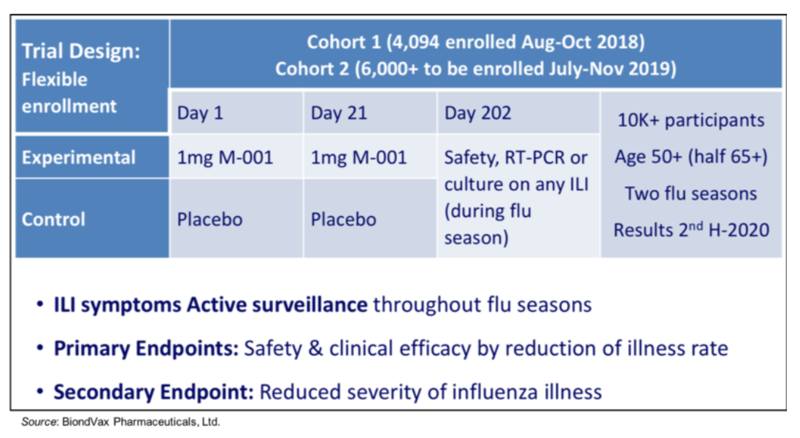 We appreciate the smaller platforms choosing to share their AUM data. Following are other important robo-advisors who chose to report their AUM data. For more information about any of the robo-advisors, copy and paste the link to read the complete review. Takeaway – Does Robo-Advisor AUM Matter? Each digital financial manager differs in their offerings. There are robo-advisor advantages and disadvantages for each investor. To decide which robo-advisor is best, it’s important to categorize what services you’re seeking, how much money you have to invest, and whether you need access to human advice, or not. Use this robo-advisor AUM data in conjunction with other research, to guide your digital investment advisor decision. As the assets under management in robo-advisors continue to rise, more companies will enter the market, and both investment and advisory choices will increase as well. The growth in robo advisors’ AUMs continues to spur an increase in competition and offerings. Investors ultimately benefit. The post Robo-advisors With the Most Assets Under Management -2019 appeared first on Robo-Advisor Pros.